The terroir is a mixture of stony clay containing more salts than somewhere else. Softly hilly summerly heat stores in malleable valleys until late night but in mornings you have colder and fresher conditions due to small runnels. This weather conditions are relevant for this wine as well in my mind. Nevertheless to produce wine in such a quality it needs excellent work in the cellar as well: the result is a very nice balanced wine of course with some wooden notes but not – as said – any dominating oak. All wines I know from Edi Simcic should mature and not been drink in the first or second year. If the vintage isn’t good enough, Simcic even doesn’t sell such vintage or usually gives it one or two more years to grow. The vineyard of Edi Simcic is right at the border to Italian vine area Triento at the very southern end of Slovenian Alps. 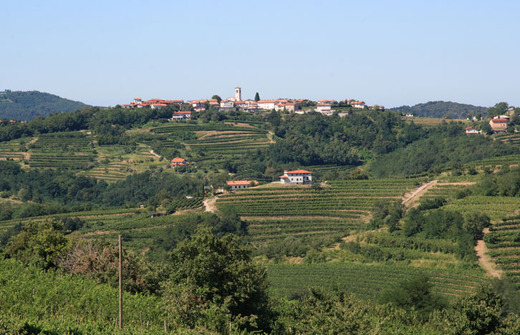 Simcic’s vinery is close to the small city called Brda where some other top Slovenian winemakers have their home, too as for instance Movia (https://avdwineandfood.wordpress.com/2015/04/14/movia-veliko-2006/). This is perhaps the most important and probably best wine area of Slovenia. Many constant wine drinkers may know some Italian producers of Triento which produce well known and even famous white wines which are produces only some kilometers away. Although the introduced wine is a Sauvignon the most popular sort of white grape is Rebula which perhaps has even a bit more character but my personal favorite is the Sauvignon. The 15% alcohol is the only real disadvantage probably. This is a perfect white wine for a grill evening (barbeque) in particular if you grill spareribs, tasty sausages or chops. Any roasting aroma of especially pork meat should be a great combination with all complex flavors of this wine. Although Edi Simcic is internationally a little bit more recognizable than other wine makers of this wine area – actually every ten’s house is somehow related to winemaking – you unfortunately cannot really find his wines easily in any bigger European country. It is a family driven business for them like for many others in this region and of course also connected to the impressive and very friendly personality of Edi Simcic. As I am sometimes mentioning the labels of wines I like to point your attention briefly to Simcic’s artful and poetic graphic: a Slovenian answer to the very nice labels of the wines of Jürgen Leiner (Kalmit: https://avdwineandfood.wordpress.com/2015/04/03/riesling-kalmit-2011-weingut-jurgen-leiner/). ende, es muy importante pensarla bien.